Junior Anthony Zhou stands next to his project at the Alameda County Science Fair. MSJ students attended the Alameda County Science and Engineering Fair (ACSEF) on March 17 at the Alameda County Fairgrounds in Pleasanton. Four projects placed in the top 15 overall and competed at the statewide California Science & Engineering Fair (CSEF) on April 23 and 24. Every year, students from all across Alameda County compete at ACSEF for an opportunity to win awards and scholarships, presenting work in all areas of STEM ranging from biology to computer science. The top 15 projects from ACSEF are selected to represent Alameda County at CSEF. Held at the Los Angeles California Science Center, the statewide competition allows students to compete for more than $60,000 in awards and scholarships. At ACSEF, MSJ projects won 28 top-four in category awards and 19 special awards. At CSEF, MSJ students won one top-four in category award and two special awards. Four MSJ projects from ACSEF were particularly well-executed, each winning first place in category and advancing to CSEF. Junior Anthony Zhou’s project, titled “Enhancing Gene Therapy through Targeted Delivery of CRIPSR/Cas9 in a Novel, Inexpensive Lipid Nanoparticle,” focused on improving upon current gene editing methods by creating a method to avoid rejection by the human immune system. Zhou’s concept was inspired after realizing that existing compounds within the human body could be used to create transport packaging for the gene-editing system. 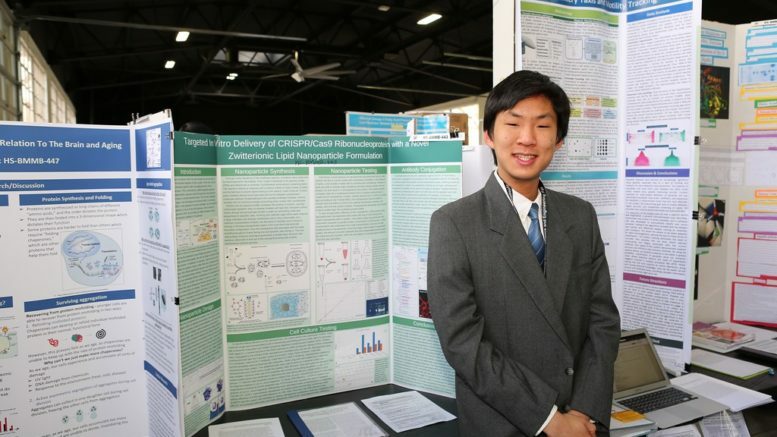 Zhou’s project placed second in his category at CSEF and also won $1,250 for the LA BioMed Award for Excellence in Biochemistry and Molecular Biology. Juniors Abhi Upadhyay’s and Jonathan Ko’s project, titled “Power Outlet Adapter to Autonomously Reduce Standby Power Losses Using Machine Learning,” also won the Chevron Education Award with $1000, and the Yale Science & Engineering Association Award for Most Outstanding Exhibit in Computer Science, Engineering, Physics, or Chemistry. The project utilizes an Arduino-based power adapter that was trained to learn when an appliance is on standby and to disable the appliance power when the appliance is on standby. Upadhyay and Ko came up with the project idea after realizing that large amounts of energy are wasted every day when appliances are plugged in but not being used. Over the course of several months, the team built and tested an Arduino-based prototype that they presented at ACSEF. At CSEF, the project won $200 for the Plug-In America EV Excellence Award for Best Overall Senior Project. Junior Saurabh Narain designed a “Mesh Network Based Wildfire Monitoring and Prevention System,” which analyzes data from a network of sensors to detect wildfires. Narain hopes that through the creation of an inexpensive and reliable smart device, future wildfires can be detected and prevented, saving billions of dollars and ensuring public safety. His project also won the NASA Earth Systems Award. Junior Kevin Chen conducted research on the prevalence and nature of cheating amongst high school students. The goal of his research was to understand the student perspective on cheating in hopes of solving this problem. With his research team, Chen interviewed students about their personal experiences and asked students to describe a personal incident of cheating, explain their motivations, and evaluate the permissibility of their actions. Students gave a wide variety of justifications and motivations for their evaluations, suggesting that the student perspective on cheating is very complicated. Chen also receives a special award from the American Psychology Association for his project. Participants in the ACSEF and CSEF gained valuable skills through their experiences. Ko said, “It was an amazing experience working together with my partner to make something we believe can really change the world. Be the first to comment on "Students Impress with Research Projects at Science Fairs"